At Xanadu Med Spa of Fort Collins, CO, we work hard to bring you only the best products. That is why we have developed our own line of skin care, designed to meet the spectrum of needs of our clients bringing you the best of what we know taking care of your skin in today’s busy world. We have provided two lines – Nouriche Mèdical and Nouriche Naturalle. We believe it is important to provide choices to meet the diverse needs of our diverse clientele. For some, the pharmaceutical-grade components of our mèdical skin care line is what they seek. Others find comfort in a more natural approach. None of our products are tested on animals, of course, but they are tested to meet the highest standards of excellence. That much you can always be assured of when working with Xanadu, your Fort Collins skin clinic of choice. Nouriche Mèdical products by Xanadu Med Spa are developed using the highest quality, pharmaceutical-grade ingredients to provide patients with system-based, results-driven cosmetically elegant formulations. 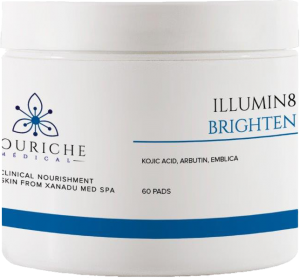 Nouriche Mèdical is created and dermatologist tested to deliver safe, superior results in treating numerous conditions and patient skin types. Our FDA registered laboratory and manufacturing facility follows the most rigorous pharmaceutical manufacturing standards to ensure safe and effective formulations. This soothing cleanser gently cleanses while providing hydration for the skin. A Soap-free formula specially formulated with soothing antioxidants and botanicals to protect highly sensitive skin. Thoroughly removes environmental pollutants, excess oil and makeup while refreshing & nourishing the skin. reducing the appearance of redness, fine line, wrinkles, puffiness and pore size. 90% Green Tea Polyphenols (the highest purified form available) help to reduce the potential for irritation and calm skin redness. Resveratrol, an extremely effective antioxidant found in red wine known for its anti-aging properties, protects against free radical damage. Caffeine USP enhances the antioxidant properties of the green tea. ingredients of Kojic Acid, Arbutin and Bearberry along with skin protective antioxidants to soothe the skin and help with redness. Kojic Acid, Arbutin and Bearberry are natural skin brighteners that promote even tone. Powerful antioxidants calm and soothe the skin. Diminish fine lines, wrinkles and achieve smoother, firmer, more evenly toned skin. The clinically proven retinol system pairs a time-released, patent-pending delivery system with soothing green tea polyphenols to provide the effectiveness of retinoid without the irritation. For facial use only. Micro Polymer Delivery System stabilizes and protects retinol to continuously and efficiently drive retinol into the skin. All-trans-Retinol helps increase cell turnover, supports healthy collagen production and brighten areas of pigmentation. 90% Green Tea Polyphenols calm and sooth skin back to its natural, peaceful state. Hyaluronic Acid provides essential hydration while helping to maintain the skin barrier function. Caffeine USP enhances overall antioxidant activity and diminishes visible redness. 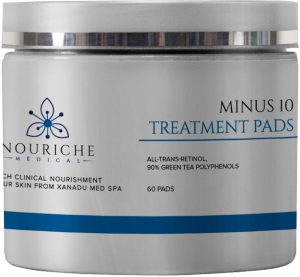 Fast-penetrating retinol based pads help achieve smoother, firmer, and more evenly toned skin. For facial use only. 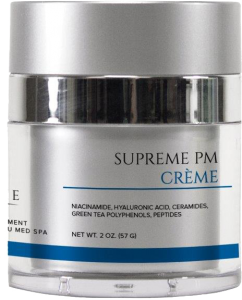 All-trans-Retinol & Green Tea Polyphenols work synergistically to build up the skin matrix and protect its components from oxidative damage. Bisabolol calms and conditions while stimulating healthy skin. Vitamin C is a powerful antioxidant that improves skin tone and texture. Awaken to hydrated, healthier, younger looking skin with this intensely moisturizing night cream. Biomimetic Ceramide Complex provides nourishment to help repair the skin barrier, improving elasticity and texture. Peptides support the skin matrix to target wrinkles. Hyaluronic Acid ensures continuous and optimal hydration. Niacinamide improves the appearance of fine lines and wrinkles, and helps to even skin tone. gentle hydration and age defying antioxidant benefits. 2% Micronized Zinc Oxide for ultimate protection. Universal Pigment Technology provides a sheer, healthy touch of color for all skin tones, concealing imperfections and minimizing the appearance of fine lines, wrinkles and pore size. Antioxidant enriched to provide exceptional broad spectrum UVA,UVB protection and quench free radicals. An acne 10% wash with aloe vera. Therapeutic, soap-free wash effectively cleanses and treats acne-prone patients without drying or irritating the skin. Fortified with Benzoyl Peroxide USP which provides antibacterial activity against Propionibacterium acnes. Excellent and affordable solution for pediatric, adolescent, and adult patients. Great for AM and PM use. Ultra pure Glycolic Acid coupled with the proven acne fighting ingredient Salicylic Acid USP, 2%. Unclogs pores and accelerates the removal of dead skin cells that can interfere with the proper oil drainage of the skin. 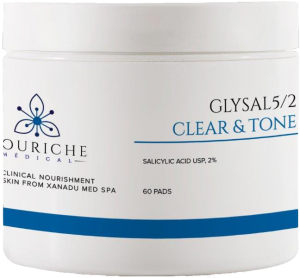 Glycolic Acid promotes exfoliation for smoother looking skin. Salicylic Acid USP removes surface oils, unclogs pores and opens up plugged follicles. Witch Hazel smooths and tones the skin. Skin Conditioners and natural botanicals hydrate irritated skin. The perfect spot treatment utilizing the antibacterial properties of Benzoyl Peroxide USP. Excellent and affordable solution for pediatric, adolescent and adult patients. Lightweight formula fortified with Benzoyl Peroxide USP for antibacterial benefits against Propionibactrium acne (Pacnes). Acne Peptide Lotion – 2 oz. This powerful anti-inflammatory lotion will help even hard-to-cure cystic acne improve without the use of Accutane. The peptides in this moisturizing lotion have the capability to heal acne scarring with the proper protocol. Inflammation is an important reason that acne does not improve. When we remove inflammation, the immune system of the body can heal the acne pustules. Reduces inflammation, so the immune system can heal the acne. Diminishes and heals acne scarring with bioactive peptides. We have combined the freshest ingredients and essential oils to deliver clean skin products that are unparalleled in today’s skin care industry. We have also hand-picked each ingredient to add a healing component to our solutions. Nouriche Naturalle excludes all parabens, dyes and chemicals which can contaminate your skin and your overall health. In addition to clean ingredients, our Naturalle products use the exact isomer, or the ‘Chirally’ correct form of a nutrient, which is more effectively utilized by the skin. Our skin care products repair and rejuvenate your skin without putting your health at risk. Remove impurities and debris without stripping the skin of its natural oils using this moisture-rich cleanser. Great foaming action without toxic sulfates or chemicals. Stimulates the immune function of the skin, promotes collagen formation, maintains the skin’s elasticity, and improves the skin’s moisture retention with beta fructan. Acts as anti-inflammatory thanks to the apple extracts. Moisturizing for skin in need of deep penetrating hydration, this lotion refreshes and soothes, allowing your skin’s natural healthy glow to radiate. The active ingredient, glutathione, is the most powerful antioxidant found in the human body. It helps increase blood circulation to the applied area which reduces swelling and dark circles. Protects and detoxifies skin with a high dose of glutathione and other potent antioxidants. Uses essential oils for aromatherapy and antifungal, antibacterial, and antiviral properties. Refines and re-texturizes the skin through the benefits of L-lactic acid, L-retinol, and L-pentapeptides. The amino acid guanidine smoothes and softens skin, while hamamelis and hazelnut extracts flush dirt and impurities from the pores. Appropriate for all skin types. Repairs free radical damage while providing antioxidant benefits from guanidine. Stimulates the immune function of the skin using beta fructan. Reduces the appearance of pores and prepares the skin for skin treatments such as Vitamin C and/or Vitamin A. This product is probably the most important skin care product. It not only protects the skin from UV damage, it also is the best anti-aging compound for skin. The increase in collagen and elastin only takes place if Vitamin C is present in the skin!! This excellent anti-aging product is a highly concentrated Vitamin C Serum with proven antioxidant and regenerative properties to help fight and repair signs of aging by building collagen and elastin. The ingredients in the Vitamin C Serum contain active ingredients that provide a direct benefit to the skin, and are not just carriers. Stimulates the immune function of the skin and increases cellular turnover. Protects against free radical damage, the leading cause of skin cancer, using antioxidants. Improves skin resilience, with an anti-inflammatory agent and a vital building block for collagen and elastin. This is a Vitamin A and glycolic acid complex that gives an energized and synergized antioxidant combination, which is an excellent anti-aging product and a stimulant of new tissue growth. Serves as an exfoliant, increasing cellular turnover so dull surface cells are shed more quickly. Provides an energized and synergized antioxidant formulation with the powerful antioxidant phenyl butyl nitrone. Plumps the skin, smooths fine wrinkles, and begins to reverse other less visible signs of sun damage. Thickens the epidermis and improves texture, elasticity, and blood circulation. This anti-aging serum is infused with a natural stem cell activator and premium Hyaluronic Acid to create a powerful restorative face serum. Plant stem cells have been identified as among the leading anti-aging solutions. It works to improve your skin’s elasticity – for a more supple appearance – and support your body’s own anti-aging functions. When combined with the incredible natural moisturizing properties of Hyalogic Hyaluronic Acid, you have an amazing facial product that will help to renew your youthful appearance and revive your complexion. Promotes Anti-Aging. Helps protect longevity of skin stem cells, delay division/growth of essential cells & combats chronological aging. Premium Hyaluronic Acid Face Serum Infused with stem cell – a natural anti-aging skin product. Our Healing Cream with Vitamin K helps people who suffer from areas of redness, purple blotches or bruising. It is excellent for lessening the appearance of small blood vessels on the face and body and promoting more even skin tone. Topical vitamin K helps minimize the appearance of bruises. Its effects are greater when used with topical arnica, a plant-based remedy used to minimize the appearance of bruising. Special vitamin K formula helps fade and clear bruises. Lightens skin discolorations and reduces appearance of spider veins on face. Helps improve appearance of broken capillaries, rosacea, and any reddened, irritated areas on face.